Demented and delightful children's story that exhibits a more sophisticated vocabulary than most of what passes for "grown-up" literature these days.Reading it, I was reminded of the Kinks song "Phenomenal Cat" from the Village Green Preservation Society album. https://youtu.be/upWnwfzA_i8This book was originally published in 1967, and Ray Davies wrote the song in 1968, so I wonder if that's just a coincidence. Misfits forming an unlikely friendship--one of the best kids' book plots. Very 60s, yet also timeless. Whimsical, nostalgic, but just a little bit long. Note: *Not* illustrated by Gorey, Gorey fans! A whimsical tale of two friends who meet in a tree. Mom or dad will have to explain a few words ("withal," "ceremoniously," "disconsolately," etc. ), but part of the charm of the story is its rhetorical register, and if it stretches a child's vocabulary, so much the better. Anyhow, Fletcher, a cat, and Zenobia, a doll, both find themselves inexplicably stuck in a tree without means of escape. When they throw a party to amuse themselves, a mode of escape presents itself. This picture book was mentioned in the fantastic "Toys Come Home" by Emily Jenkins, so I really wanted to read it. This was another $5 ILL charge, but well worth it. 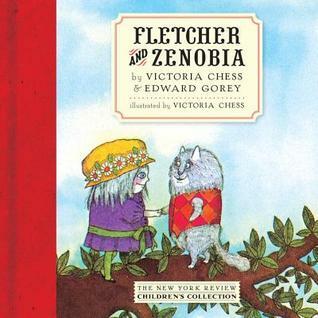 Fletcher is a cat who lives in a tree and Zenobia is a doll who hatches from a huge paper-mâché egg. They have a party, wear hats, dance to a gramophone, and meet a moth who presents the solution to their problem. Quirky and charming, this would make a lovely read aloud to a young child. Very old Edward Gorey, perhaps he was less morbid back then. This one is actually appropriate for children. A cat and a doll with a big trunk of supplies try to figure out how to get out of a tree. But they are too busy dancing and making massive feasts to fret too much about it. Fletcher is one very attractive fat cat character. I collect books written and illustrated by Gorey. I love his books and this is illustrated by another illustrator Victoria does a perfect job. I recommend Edward Gorey to those who enjoy darker stories and twisted humor. Although rare, this imaginative and wry book is worth sitting down with immediately if you can find it. Edward Gorey Victoria Chess - Born in Chicago, Gorey came from a colorful family; his parents, Helen Dunham Garvey and Edward Lee Gorey, divorced in 1936 when he was 11, then remarried in 1952 when he was 27. One of his step-mothers was Corinna Mura, a cabaret singer who had a brief role in the classic film Casablanca. His father was briefly a journalist. Gorey's maternal great-grandmother, Helen St. John Garvey, was a popular 19th century greeting card writer/artist, from whom he claimed to have inherited his talents. He attended a variety of local grade schools and then the Francis W. Parker School. He spent 1944–1946 in the Army at Dugway Proving Ground in Utah, and then attended Harvard University from 1946 to 1950, where he studied French and roomed with future poet Frank O'Hara.Although he would frequently state that his formal art training was "negligible", Gorey studied art for one semester at The School of The Art Institute of Chicago in 1943, eventually becoming a professional illustrator. From 1953 to 1960, he lived in New York City and worked for the Art Department of Doubleday Anchor, illustrating book covers and in some cases adding illustrations to the text. He has illustrated works as diverse as Dracula by Bram Stoker, The War of the Worlds by H. G. Wells, and Old Possum's Book of Practical Cats by T. S. Eliot. In later years he illustrated many children's books by John Bellairs, as well as books in several series begun by Bellairs and continued by other authors after his death.